Belfair serves as the commercial center of North Mason County. 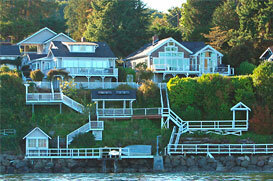 Located along the Union River, inner most waters of the Hood Canal, and part of the Puget Sound. In the summertime tourists and nature lovers flock to Belfair to enjoy the boating, fishing, hiking, biking and camping. Belfair hosts “The Taste of Hood Canal” in August which features local foods, artists, and a classic car show. The Hood Canal Theler Wetlands is 135 acre center for environmental recreation and education. With many walking trails, tidal wetlands and views of the Hood Canal and Union River you will experience the variety of wildlife throughout the wetlands. Belfair is the last town with services before reaching Tahuya State Forest with its many off-road vehicle trails, mountain biking trails and park. Belfair is North Mason County’s service hub. Harrison Hospital operates an Urgent Care, many doctors as well as other professional services in town. The town features local and chain restaurants and local shopping. There are several public golf courses nearby as well. Belfair serves as a gateway town for the Hood Canal region. With many trails and outdoor activities Belfair connecting the Kitsap and Olympic Peninsula.